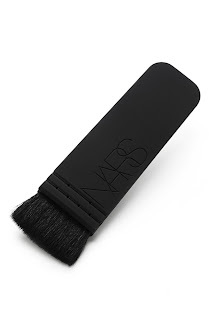 The NARS Ita brush was released as one of two Kabuki Artisan brushes made of super black goat hair and based on traditional Japanese Kabuki brushes. Advertised for contouring (something I rarely do), I did not feel the need to spend $38.50 to watch it gather dust. A month later I was given the Ita as a gift. Still puzzled as to how to use the brush, it was not until I started using Albatross (a highlighter by Nars, really perfect you must go look for this) that I understood how useful a tool this is. The long flat line allows me to pick up just the right amount of highlighter, sweep it with precision across the top of my cheekbones, then blend it down into my blush seamlessly. It's amazing, application was never so easy! As someone with 50 or so brushes not a single one does the job like my Ita. It is my go to cheek brush. I use it for bronzer on the hollows of my cheeks, to apply blush to the apples then sweep it back up the cheeks, to add highlighter and blend to pro like perfection! Above all it blends everything you do so well you can branch out and be creative. It's really made a difference in how I apply my cheek colors and the overall result. The Ita makes it very easy and fast so you will find yourself doing things you normally passed on in your everyday face. Overall a fabulous brush with a design unlike any other cosmetic brush I have seen. It reminds me of the Japanese wash brushes used in watercolor painting. I cannot wait to try the other artisan brush in this series, the Boton, and I would be very curious about any other releases in the Artisan line. Disclaimer: This product was purchased by the reviewer, Storybookheroine. I think this type of brush works better than the traditional makeup brushes...pick one up, you'll see!!! I LOVE the way this brush looks. I'll definitely be calling this in! Great looking...what is the handle made of? Hi David, the handle is a hard black plastic with NARS engraved on the toward the top. It is split down the middle of the thin side and the brush itself is suspended between this. It's really a unique and cool design. I am so intrigued by this brush. Is there another version of it on the market that's slightly less pricey? not that I know of but I am sure someone has seen something similar somewhere. One of the posters above mentioned an art store brush for $4. Thank you for the reply! you should review Sonia Kashuk brushes- they may be cheap, but they are amazing quality for the price. love the site!! !